First published in 1981. Martin Buber has been acclaimed as one of the major philosophical and religious thinkers of the twentieth century with his influence and achievements spanning numerous fields — however in each of these areas his work has also been severely criticised and his influence called into question. This volume brings together in a systematic arrangement all the significant material by and about Martin Buber published in English up to the centenary of his birth in 1978. 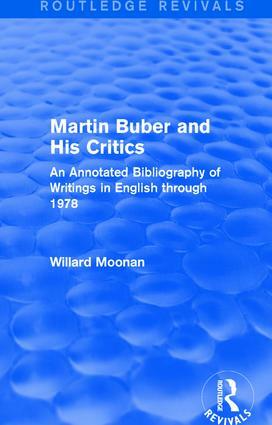 To make the bibliography as useful as possible, the critical material was annotated and various indexes were constructed, including an extensive subject index to both Buber’s works and the criticism.